Review: Alex DeLarge is a charismatic and psychopath delinquent. He likes to practice crimes and ultra-violence with his gang. He is then jailed but volunteers for an experimental aversion therapy which is developed by the government in an attempt to solve society’s crime problem. Let’s just say things don’t go according to plan. Based on a 1967 novel by Anthony Burgess. Burgess originally wrote his novel as a parable about Christian free will and forgiveness. Two of the main themes that occur in this are morality and psychology. Also it is about order in society vs. freedom of choice, the necessity of evil in human nature and also the independence of life and art. Burgess is actually a very serious novelist who comes from a Catholic background and is very interested in themes of good and evil. This has had a very mixed past with the BBFC. When originally out in cinemas it was rated X which was originally for people aged 16 this bar was then raised to an 18 certificate (passed an X with no cuts). The BBFC secretary, Stephen Murphy, stated at the time “Disturbed though we were by the start at the first half of the film, which is basically a statement of some of the problems of violence, we were, nonetheless, satisfied by the end of the film that it could not be accused of exploitation: quite the contrary, it is a valuable contribution to the whole debate about violence”. In 1973 there was so many copycat violence and so many threats made to Kubrick and his family that he withdrew the film from circulation in the U.K. It was not until his death in 1999 that his family agreed to permit the release of the film again. This still remains an 18 uncut certificate. Malcolm McDowell’s character age is 17, his actual age is 28 years which means there is a difference of 11 years. During one of the scenes he was temporary blinded and also suffered cracked ribs. 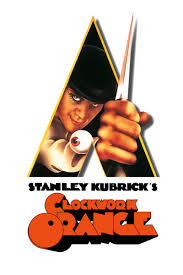 A lot of the impact of the film is due to the incredible performance from Malcolm McDowell. All the unused footage was destroyed by Kubrick’s assistant. Once you have seen this film you will never forget it. It contains some of cinema’s most memorable sequences. However, the violence is extreme and very disturbing. The poster must be one of the most iconic images in cinema history. This film is a cult classic. In 2013 Film Critic Barry Norman produced a list in the Radio Times of his 50 Greatest British Films of all time and this was in the list.